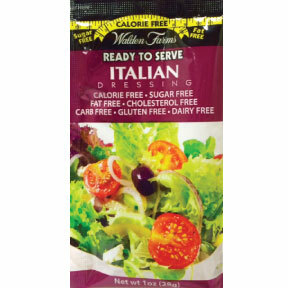 1 oz italian flavor salad dressing in individually sealed single serving pouch. Calorie Free, Sugar Free, Fat Free, Cholesterol free, Carbohydrate Free. Gluten Free. Dairy Free. A convenient travel size for on the go. Ingredients: triple filtered purified water, apple cider vinegar, salt, white vinegar, vegetable fiber, onion powder, xanthan gum, minced garlic, cellulose gel, red bell pepper, sodium benzoate, potassium sorbate (to preserve freshness),white pepper, oregano, citric acid, sucralose, lemon juice, parsley, natural flavors, basil, FD&C yellow #5, yellow #6. Contains trace calories.